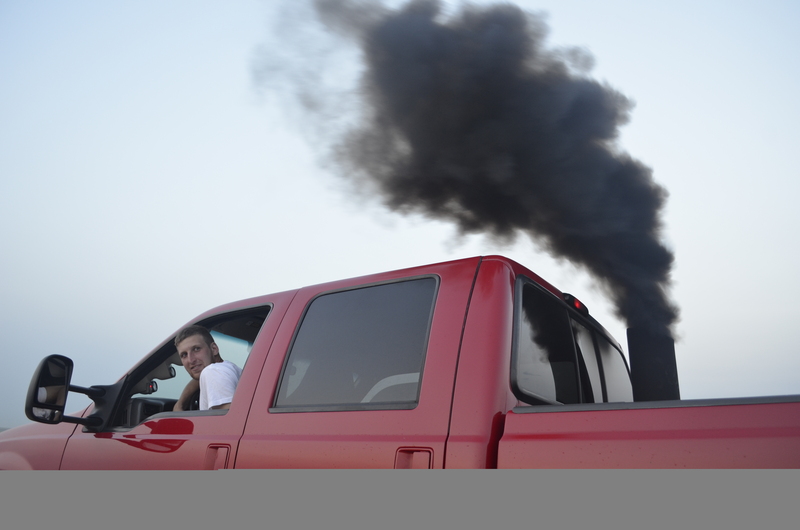 People who hate it, call it “pollution.” People who love it, call it “rollin’ coal.” We’re talking about the plumes of black smoke that come pouring out of some diesel pickups. These pickup truck owners are retrofitting their rigs to allow for unburnt diesel fuel to spew from a tailpipe or vertical stack during a fast acceleration. When smoke pours from a pipe or stack, the unburnt diesel is thick and black. Mark Pyatt of Killer Diesel Performance talks about the young men and women who love to roll coal in oil country. Guy Rollin’ Coal in Red Pickup: Calvin Fields of Williston, North Dakota. Story and photo by 2 below zero’s Todd Melby.